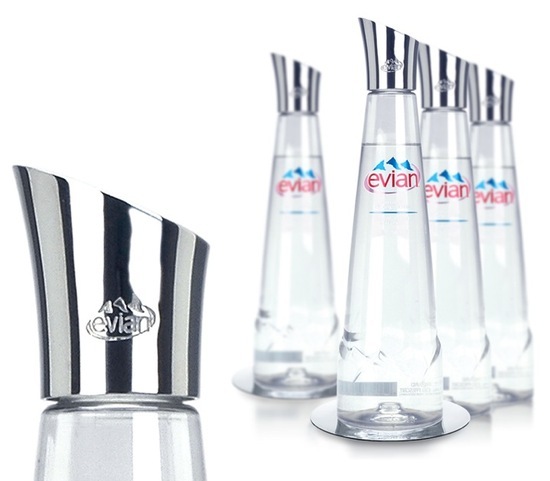 The Evian Palace bottle comes in three pieces: a metal base with the embossed Evian logo that sits on a table (at exclusive restaurants only) as a suggestion device prior to the arrival of the waiter; the 750ml bottle itself, which is made of glass-like PVC, slender than its mass-market version (the Palace design has an embossed Alps logo around its base and downplays the pink and blue Evian logo at its neck); a stainless steel pourer added on top by the wait staff after removing the regular cap. As overall effect, the bottle looks like a carafe, sits on its own coaster, and the pourer is designed to slide a stream of water into your glass with as few bubbles as possible. The restaurant keeps the metal components and recycles the bottle.